All Foot Health Practitioners should consider Alliance membership…. because the Alliance keeps the Accredited Register of Foot Health Practitioners. Accredited Register members belong to a register that has been assured as meeting the high standards determined by the Professional Standards Authority. 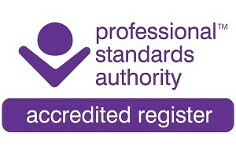 The Professional Standards Authority approval permits use of a reserved mark of quality and is intended to be 'mandatory through choice'. practical) to prove the absolute ability to do the job. To apply for entry to the Accredited Register or to arrange a Test of Competence, contact the Registrar (details below)…. The Alliance has Podiatrist members. Podiatrist members enjoy all of the benefits of membership, but they are regulated by the HCPC. The Alliance has Foot Health Practitioner members who enjoy all of the benefits of membership. Alliance Foot Health Practitioner members are listed on the Accredited Register of Foot Health Practitioners. Alliance Foot Health Practitioner members are automatically members of the Accredited Register of Foot Health Practitioners. Membership of the Accredited Register requires proof of qualification and where applicable, proof of insurance. A Test of Competence (theory and practical) is applied where claimed qualification is not recognised or cannot be documented. The Alliance refuses membership to those whose training history is insufficient. Top-up training or re-training may be recommended before membership can be considered - learn more. Refreshment can only apply to recognised training. Refreshment of training is not the same as top-up, and cannot be applied to initial training that is insufficient to 'refresh'. It is the Alliance Policy that Rulebooks will not be re-issued annually to existing members. All Rulebook updates will printed in the quarterly Journal and published on the Alliance and Accredited Register website.